Athletes experience many issues while training, and hip pain is one of the most common ones. The main cause of hip pain after running is inflammation that is typically found within the soft tissue or tendons. Athletes shouldn’t ignore hip pain after running and should always take the proper precautions immediately to prevent long-term chronic conditions. What Causes Pain after Running? 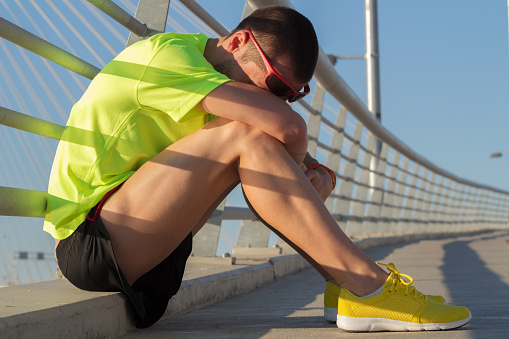 Stress fracture: For runners, this tends to occur if you have been running on concrete. You will likely experience pain on the inside of your hip and feel a throbbing pain in the groin area. Injury: If you experience pain that is followed by a clicking feeling after you fall on your hip or if you twist your body, it could be a cartilage tear. Seek advice from a sports specialist to confirm if there is a cartilage tear and if that is the cause of your pain. Bursitis: If you experience an ache, or if one of your leg muscles tightens up, chances are it is caused by inflammation of small, fluid-filled sacs called bursa, which lubricate your joints. This is called bursitis and is mainly caused by the overuse of your hamstring. The burning/rubbing sensation is usually around the outer side of your hip. Insertional tendonitis: This causes problems in the hip flexor, which is the muscle that is used to control the knee. Iliotibial band syndrome: This occurs when you are experiencing pain in the hip as well as the knee. Running on the same side of the track for long periods of time may cause this. Muscle weakness: Experiencing pain in the hip, knee, and feet could be a result of muscle weakness. Over-training: For many athletes, micro-trauma to the muscles is caused by over-training. If not treated and monitored, it can turn into muscle strain over time. Abductor strain: Pain experienced in the inner thigh and hip could be a result of an abductor strain or pull. Osteoarthritis: Those suffering from osteoarthritis, which is a common type of arthritis, may experience pain in the hip as a result of degeneration of the hip joint. Hip pointer injury: A forceful impact on the pelvis could cause a hip pointer injury. It can be very painful and become serious if blood seeps into the hip abductor muscle. Heat: Some athletes use heat pads after running if they have arthritis in their hips. Others will draw a hot bath or shower, which can help soothe the joints. If you have bursitis, however, it would not be a good idea to use heat. Ice: After your run, consider using an ice pack for about 20 minutes. If the pain is severe, avoid running until the pain has reduced. Hip abduction: Stand in a straight position and raise your leg towards the side. Use a table or chair to maintain your balance and keep your knee/back straight at all times. Then squeeze your thigh and hip abductors when you lift your leg. Hip flexion: Stand up straight and lift your knee slowly, upwards toward your chest. Repeat 10 times. Hip extension: Lie on your back on a bench with your hip placed at the end of the bench. Leave the leg (on the injured side of your hip) hanging towards the floor and raise your other leg towards your chest until you feel a stretch. Hold it for a couple of seconds before you set it down. Warm up properly before exercising. Wear well-fitted shoes that have a comfortable grip. If you still feel stiff during exercise, stop and stretch again. Before training, have any pre-existing foot, hip, or knee injuries examined first. Anytime you experience sharp pain in your hip, especially if it’s also felt in the foot and knee, make sure you treat it immediately. If the pain becomes more severe, consult a doctor or a sports specialist and have them diagnose the exact cause of the injury. Adickes, M., “Hip Pain While Running,” Ironman Sports Medicine Institute at Memorial Hermann web site; http://ironman.memorialhermann.org/performance-improvement/sports-science/runners/hip-pain-while-running/, last accessed July 21, 2015. “Hip Pain from Running: Causes and Treatments,” MDHealth.com; http://www.md-health.com/Hip-Pain-Running.html, last accessed July 21, 2015.